The Just Us vocal quartet exhibits love of well-written song and love of that mystical place where only these songs can take you; a place where taste and vulnerability abound. They delight in preserving and interpreting what is now known as the Great American Songbook, those songs that make you want to return to a place in memory where love was new and the summer nights were twilight soft. Just Us lives there. They have that rare knack of selecting material that is meaningful to both themselves and to their audience as participants, I’ve focused on the aural but Just Us are also superior performers who have much presence. They are a visual delight, as much fun to watch as to listen to. This charming quartet consists of Barbara (the Blonde and soprano), Janette (the Brunette and alto), Brian (the Lion, tenor and musician) and last but not least, Paul (the small and the bass). Whenever they appear close to you, do your eyes and ears a favor and support this joyful quartet. I guarantee when you leave you will feel better than when you arrived. 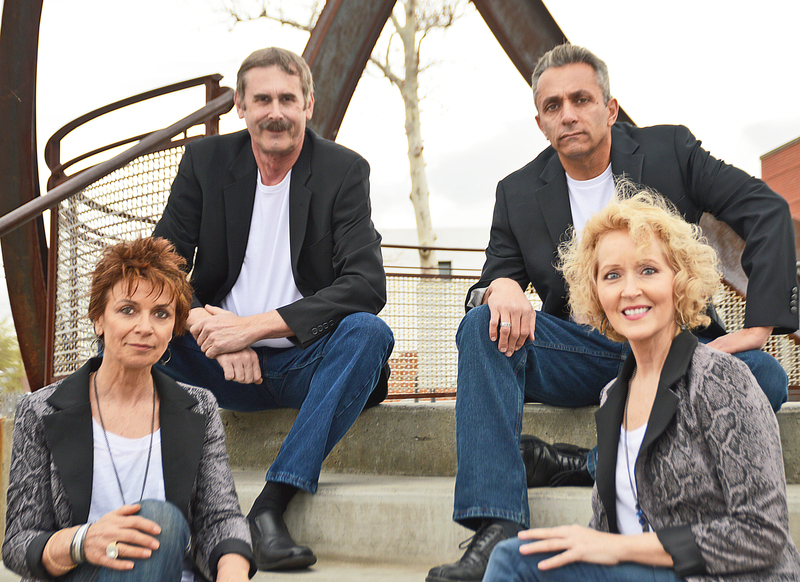 Just Us is the “real deal,” the complete vocal package, four delightful vocalists (Paul, Janette, Barbara, Brian) with charm, good humor and talent. The first thing you will notice is the beautiful blend of their voices, masterful phrasing and warm intimacy. They have a love for the the Great American Songbook and that mystical place where only these songs can take you, a land where taste and beauty abound. They sing the songs that make you want to return to a place in memory where love was new and the summer nights were twilight soft. Do your ears (and eyes) a favor and catch their next performance. These four love what they do and that ensures that you will also. Pure perfection. ..are the first words that come to mind. An evening with “Just Us” will put a smile on your face. Any stress from your day will melt away as the music surrounds you and your senses are reactivated to the music performed by this magical group..They are talented and fun to watch. Dont miss a chance of being entertained by..”Just Us”.